Experience the software for free: download the demo version right now and get a clear idea of all the possibilities Heredis has to offer. Let the quick entry window guide you or import a GEDCOM file. Share with whomever you choose and edit documents. Search for your ancestors amongst archives in Europe as well as in the rest of the world. Capture official documents, enhance your photos, create albums and slideshows. Construct fabulous family trees and print them! Track the progress of your genealogy and display your data. Perhaps you have already entered your genealogical data in another software… There is no need to re-enter everything in Heredis! Simply import your genealogy file directly into Heredis. 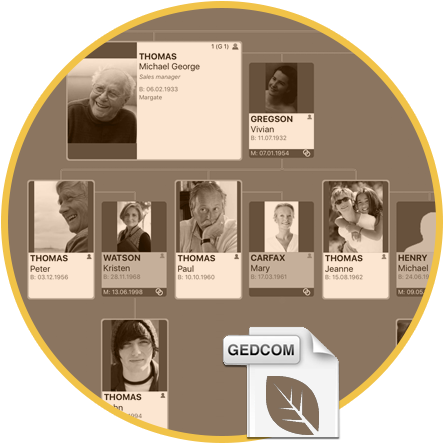 GEDCOM importing and exporting in Heredis is compatible with the international standard for exchanging genealogical data, and includes photos, videos, audio and pdf files, URL, notes, etc. Basic, comprehensive or customized, at every stage. In Heredis, a date can just as well be entered with numbers, with or without separators, with numbers and letters, completely spelled out or abbreviated. It can also be entered according to a Gregorian, Julian, French Republican, or Hebrew calendar. The date converter tool allows you to convert dates entered in any of the four above-mentioned calendars. Each time you print a sheet, a report or a chart, you are given the option to choose your date format. When creating your very first tree, the quick entry window will prompt you to enter data for the first/primary person in your family. This will generally be yourself: Surname, Given Names, Occupation, Gender, Date of birth, Place of birth, etc. You may then assign a source to your event, such as your birth certificate, and a picture of yourself. Do the same for your parents, their parents, your spouse, your children, etc. Adoption, birth, christening, marriage, census, military service, etc. There are dozens of event categories. Customize events or share events with several persons in your genealogy. You can complete your data by adding scanned images (photographs, signatures, coats of arms, etc. ), sound recordings (interviews, speeches…), videos, or documents prepared in another software. Media can be added to: a person, a couple, an event, a source, a surname, a given name, an occupation, or a place. Easily enter several persons and their relatives under one same data entry screen: the primary person, his or her parents, spouses, children, and even spouses’ children are represented. A source is the origin of the information you have found. It can be an original document (such as manuscripts, correspondence, notes, etc. ), an official document (e.g. civil or religious records), or a “reference” work (an autobiography, a research paper, a scientific presentation, etc.) that can validate the authenticity of the information. Among other things, Heredis allows you to categorize your sources and to manage the level of certainty/quality of each source. Heredis gives you the option to manage 3 levels of sources: repositories, sources, and source citations. Save time by sharing an event with several persons in your genealogy in just one simple entry. This is particularly useful for instance with census records: enter the event once and link it to every person mentioned in the document. Define your own types of facts and enter information such as education levels, religions, physical descriptions, nationalities, social security numbers, etc. Include several spelling variants for one same name. Throughout centuries, the spelling of surnames has often been modified, as you will see for yourself when doing your genealogical research, and you will certainly find various spellings for one same family name. Choose the current spelling as the main surname and you may then assign all the name variants you have recorded. Ahnentafel is a genealogical numbering system for listing a person’s direct ancestors in a fixed sequence of ascent. Use your own numbering system for the persons in your genealogy. When you import data from FamilySearch, Heredis will keep your FamilySearch numbering. Browse public archive records and large genealogy databases online. 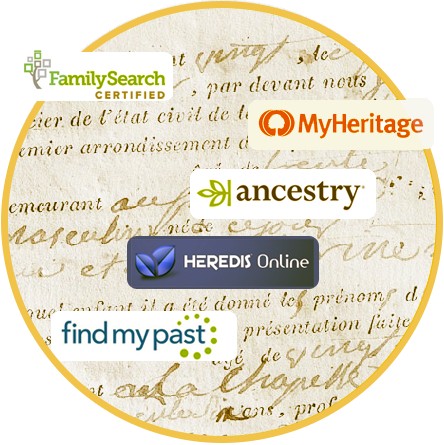 Directly from Heredis, you can capture civil status records, registers, and any other document useful to trace your ancestors and their family history. Select a person in Heredis then let the search wizard explore databases such as FamilySearch, Heredis Online, Ancestry, MyHeritage, FindMyPast, etc. Use the capture tool to integrate newly found sources directly into your genealogy. comfort of your home and free of charge. Search in their universal Family Tree and access numerous digital documents. together if you wish to. corresponding events, notes and sources. Everything you need is within reach when in Heredis: national archives, military databases, libraries, in the entire world – in the US, in the UK, in Europe, etc. Capture the documents you find and add them to your genealogy. Always at hand, it allows you to search for persons, places, sources, media, etc. Thanks to this powerful multi criteria search engine, sift through your data, find events such as families without lineage, children born the same day or out of wedlock, personal or family events, etc. Create your own search models and save them for later. As an example, it is easy to find all instances of “St” and replace them with “Saint”; this tool can be combined with Smart Search and be applied to various fields such as notes, description/cause, or even health and place subdivisions. 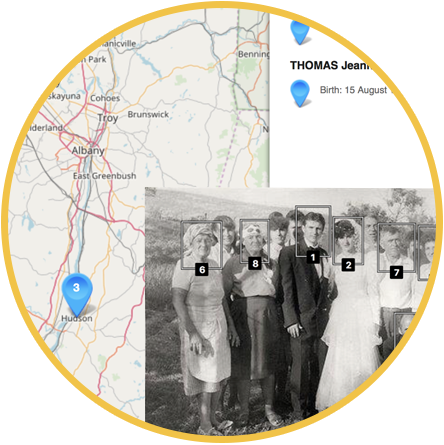 Heredis lets you view your family under four different angles, which is ideal to bring to light information you might have overlooked otherwise. These views may give you important new insights for your research and a better understanding of your family history. The Immediate family view displays a person’s direct family members (parents, grandparents, spouses, children). Go straight to the point by adding a new person in the Immediate family. Adding a child, a spouse, a parent or a grandparent is quick and easy! In just one click, access directly the new person window in simple mode. A “super size” tree with the entire family – View and edit all your relatives and contemporaries in a fully redesigned family tree with 4 zoom levels. Visually identify the whereabouts of your ancestors! Discover the location of your roots thanks to our color-coded location tree. Discover over 30 illustrated tree options created by a painter and artist. These ancestors’ trees have been developed to add a touch of originality and should definitely be printed. Not only are they beautiful but they are also easy to customize. No other software can claim a selection of such superior quality family trees made available in just two clicks. Thanks to a powerful formatting tool, you can make and see changes in real time. These designed pedigree charts can hold up to 7 generations and be printed from A4 to A0 paper. Display descendants using an optimized and clarified presentation. The different spouses of each descendant are presented in the same box, each with their own number that can then be found on their children. A very useful feature to locate and visualize half-brothers and sisters. Edit and print reports, sheets, and illustrated books. Share your family trees on the net and from all your devices. Display your family album and tell the story of your ancestors. iPod touch, a tablet, or an Android phone. Genealogy apps on Android and iOS are FREE. Publish your genealogy on Heredis Online directly from your software. 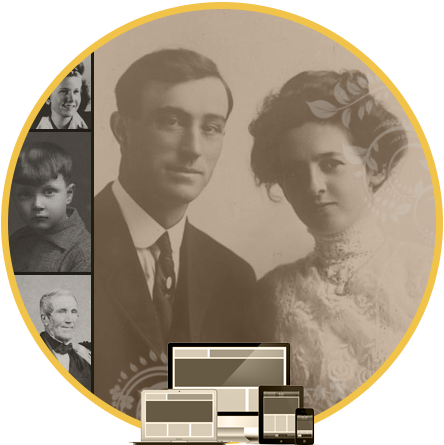 You are just a few clicks away from creating a website dedicated to your ancestors, which you can share with whomever you choose and at absolutely no extra charge. You may add a password to grant access to your website – your genealogical data is under your control and you are the one in charge. Generate, personalize, export, and print reports of persons, events, families, sources, places, etc. Heredis also allows you to publish a sheet for each person or each family in your file. Print, export, analyze, work on each ancestor again. Use the Heredis sheets to display the information you need and choose the layout you like best. Heredis can write the story of your ancestors for you. Ancestors’ and descendants’ books allow you to create an actual family book, using the appropriate terminology, which includes a preface, an introduction, genealogical tables, and an index at the end of the document. Your personalized, automatically generated book is an opportunity for you to make an original gift for a birth, a wedding, or even to make a presentation during a reunion with your immediate or extended family. Other types of books can be printed such as the patronymic dictionary (inspired from the famous Genealogical Dictionary of Canadian Families, in Quebec) or even the “Clan” book. Your family pictures are displayed onscreen with 9 different background designs and musical themes for you to choose from. Export your ancestors’ slideshow to a USB key and share it on several computers or even on your TV if it is equipped with a web browser. You are also given the option to choose which type(s) of photos to include in the slideshow. The Heredis genealogist’s toolkit makes the whole difference. Focus on your genealogical activities and reach new summits! Capture genealogical documents, official records, images, faces, details from a picture and even identify persons on the photo. A person you do not recognize at first may later be identified by one of your relatives, which will allow you to add information to this photo. If your pictures are not perfect, you can correct them easily. Crop them, rotate them, increase saturation or convert color pictures to wonderful black and white images. Create real albums, publish them online, and share them with your friends and relatives. Each event associated with a place is illustrated on an interactive map. Heredis is the only software that can not only show places but also migration flows for an entire family on an interactive map. Within seconds, you can trace your ancestors’ lives and the whereabouts of their lineage, be it a few miles away or at the other end of the world. Each map marker indicates the list of events inventoried for this place. An ideal tool to simultaneously visualize the migrations of all immediate family members and to grasp a better understanding of a family’s history. The date converter tool allows you to convert any date entered in one of the four calendars recognized by Heredis: Gregorian, Julian, French Republican, and Hebrew. Edit amazing fully-customizable reports and export them to Microsoft® Excel or CSV format, even directly from Smart Search… 4 models are available: Ancestors, Descendants, Persons and Events. Heredis offers a specific feature for searching and reviewing potential duplicates based on criteria you define. You can then examine the results and merge the actual duplicates. You are also given the option to edit this list and to mark potential duplicates. An ideal tool when importing a file from a cousin. Besides, when entering genealogical data hastily, it is quite frequent to mistype a date or even to confuse homonyms. To help avoid such mistakes, Heredis checks each new entry to make sure that the data you have just entered is consistent with persons and events already saved. Heredis offers an easy-to- use merging tool that allows you to select which data you wish to keep from either duplicate before you actually merge the two persons. Make your work space fit your personal tastes and habits. Menus, buttons, the toolbar, side panels, color themes, your preferences for appearance and automatic entries, the creation of shortcuts – all of the above can be customized in Heredis. The Dashboard offers a unique monitoring tool for your searches: in one quick look, you will know where you are at in your genealogy. You will know almost instantly how much information you have recently added. Detailed info allows you to undergo more in-depth analysis of your file and to get a clearer idea of what you have already found and what is still left to do. Heredis publishes tables with numbers and graphical representations of your genealogical data in the form of curves, histograms, or sectors. Clouds of occupations, places, names, etc.